This first floor Veranda has 2 bedrooms plus a den with fantastic views of the 16th tee box and just a short walk to one of the many community pools. I promise you you will not be disappointed with your stay in this luxury condo. My other rental properties are rented year after year with many repeat and referral guests. The Kitchen is loaded with modern stainless steel appliances, granite counter tops and wood cabinetry with tile throughout. This luxury veranda home will provide you with all the comforts of home. There are no stairs to climb with this unit and you are just steps away from a 1 car garage. Heritage Bay is the newest Lennar golf development located in North Naples. The championship golf course offers 27 challenging holes designed by Gordon Lewis and Paul Azinger. The course and community are nestled in a tranquil nature preserve with numerous lakes and palm trees. This fully furnished newly built 1st floor veranda home will give you a fantastic view of the 16th tee box. Watch the golfers or the wildlife from the back lanai or take your book and a glass of wine and relax in the front lanai. The Heritage Bay Clubhouse features a 37,000 square foot facility housing the pro shop, full service locker rooms, fine and casual dining, bag storage, card room, saunas, billiard room and a bar and grill overlooking the 23rd and 27th holes. We loved our stay at Dave’s place. I would highly recommend to anyone looking for a rental. We had a wonderful experience working with Dave and VRBO. Our daughter needed to rent an apartment / condo for a month before moving into her apartment that was available in September. Luckily Dave's verandah was available! His home is beautiful and has everything you need included, not to mention he is so nice to work with! I would definitely rent from him again or recommend the verandah to anyone who is looking. Located on the west side of the Heritage Bay, the view from Dave's lanai across the pond and down the Cypress 16th with the woodlands beyond is a piece of art waiting for a frame. The 16th tee box is over 200 feet away from the lanai so that activity on the course doesn't become an intrusion on your vacation. We spent most of our waking hours in the unit on the lanai, retreating to the also pleasant east side verandah for the couple of hours where the lanai was in direct sunlight, only to return to it for the great sunsets and early evening serenity. There is no traffic noise or off site lighting interrupting this very peaceful setting. The unit furnishings and accommodations more than met my wife's very critical standards. The pictures above don't do it justice. We were very comfortable and felt at home. The Heritage Bay golf course usually doesn't beat you up getting to the greens which is where it's true personality is displayed. Pine 4 and 8 are among my favorite golf holes in south Florida. The golf staff are terrific and the owner players proved to be friendly, gracious and interesting people. The very enjoyable Mercato mall with it's shops and great restaurants is an easy drive from the unit, as is Wiggin's Pass state Beach. A burger from Stevie Tomato's in the mall at the 1st light west of Heritage Bay is also recommended. 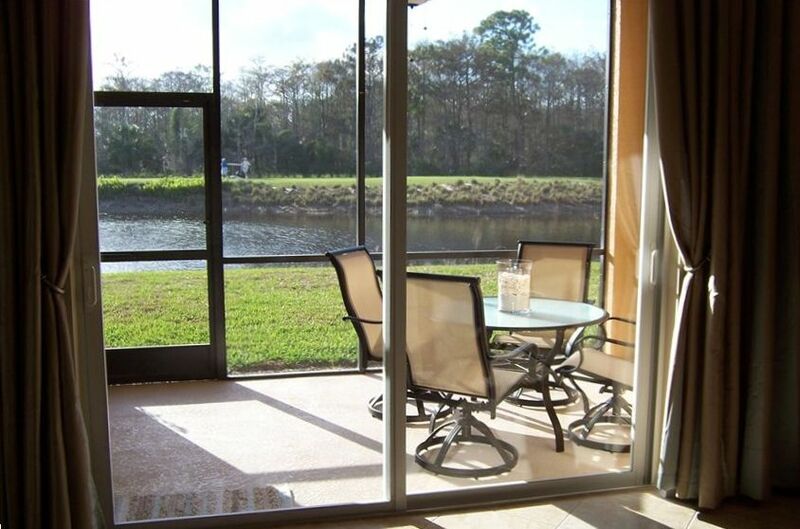 The Veranda unit is beautifully furnished inside and outside on the lanai's! The kitchen has everything you need to prepare any type of meal. We were very comfortable the 3 months we stayed in this unit in other words it felt like "home". The garage is an added bonus. There are bikes, beach chairs, and umbrellas. The owner is great, he responds to all questions or needs immediately. The golf and tennis are superb with lots of events! You will also meet the nicest people. The pools are beautiful as well as all the amentities the club has to offer. We stayed in the condo for the month of December 2010. We absolutely loved it. The condo was just like a home away from home. It is truly well equipped and nicely furnished. We loved the west facing lanai where we relaxed and watched the sun set many afternoons. The bikes were a very nice extra that we enjoyed immensely. We would definetly go back for another stay. Dave is a great owner to rent from. Thanks Dave!